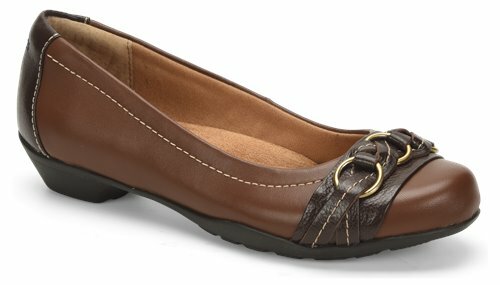 An attractive flat with braided leather and ring accents. Love this shoe, most comfortable and stylish! Love these shoes! They are soft, very comfortable and can be worn with jean, or dressy pants. I will be ordering more in differenct colors. My wife loved these when I got them for her. We went ahead and ordered 5 more pairs, some of different color. We stated doing this with shoes she likes so she'll never run out. I buy these 6 at a time...most comfortable yet attractive on these wide feet. These shoes are amazing. So comfortable. I am on my feet all day and actively walking and am comfortable. I love these shoes. They are comfortable and fit me to a tee. I work 10 hours a day and am on my feet the majority of the time. I highly recommend for comfort and style. These are so comfortable. I have a wide foot and am thrilled that they come in a wide. Many color choices too. I have mant pairs of these shoes. I have many colors of this style. Love them. Comfy too. These are super-cute and comfy!!! So stylish, but able to fit us ladies with large, wide feet! Will DEFINITELY buy them again. I have many pairs and they are very comfy. Very comfortable. Has cushion and feet do not hurt at the end of the day.